DROGHEDAH, Ireland - A golf course with the odd name of Laytown and Bettystown Golf Club is one of those Irish links courses most Americans - or Europeans for that matter - may have never heard about. But, the golf course is a great, affordable way to play a true Irish links course without the high cost associated with some of the more famous ones. It's right outside of Drogheda in the little town of Bettystown. Betty is nowhere to be found, but photos of Ryder Cup vice captain Des Smith are all over the joint - Smith cut his golfing teeth here, as did his whole family. There is a photo of him, one of many, that shows him accepting a trophy as a junior, or as they call them here, the wee ones. "From Dublin north, this coast is dotted with little, links courses like this," said Frank Fitzmorris, who lives about 40 minutes away. "There are dozens of affordable links courses around here." Bettystown is a true links course, in that it's on a piece of land between the Irish Sea - sometimes almost in the Irish Sea - and inland. 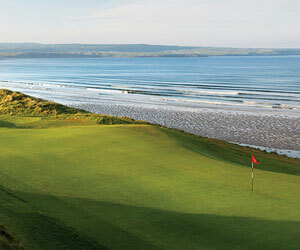 The front nine plays up and down and through grass-covered sand dunes soaring to 20 or 30 feet high. And woe be to the hacker who is off line with his driver, or even his approach; there are valleys, nay canyons, behind those dunes in which your golf ball will remain forever in Ireland. You'll need to be a contortionist to pull off some errant approach shots. "Amazing terrain," said Fitzmorris, playing the course for the first time. "It's like the moon with grass on it." Same for the rough. It hasn't even grown out yet, this being Ireland's end of winter, but it is deep and nasty and swallows golf balls as if you'd hit into the gray, churning sea. Hitting out of the rough is a separate adventure, if you can even find your ball. So, the object here is to be straight and accurate, with length a secondary objective. For the first-time links player, it may be difficult at first to distinguish the fairways from the rough, it all being so green. But, you'll know it after your first wayward tee shot. Bettystown is a fun course to play, with its long par 3s, blind shots, hillocks, rough, dunes and other assorted hazards she tosses your way. I haven't even mentioned the pot bunkers yet. Many of the holes on the front nine play alongside the sea, like No. 2, a 309-meter par 4 with big movement in the fairway and an elevated green. If you can hit it over the big hump in the fairway - if, I said - you'll get a great roll and end up close to or maybe even on the green. Or No. 10, which has a great view of the sea from the tee box. It's a dogleg left, but local knowledge comes in handy here. You can cut the dogleg, but if you're too far left, you'll find the landing area, which can't be seen from the tee, drops off the face of the earth with all sorts of nasty Irish growth in the ravine. The back nine isn't as dramatic as the front, in terms of elevation change or views, so they make up for it with added length. The long, par-5 closing hole is a doozey. The hole bends left like a banana, the fairway narrows and the unseen green is guarded by two sets of hills, one about 130 yards out, the other right in front of the green. There is a little, narrow path between the hills to the green, but you have to be in perfect position to exploit it. Laytown and Bettystown Golf Club is a great way to be introduced to the Irish links experience, and many have done so. Even for the hardened links veteran, it's a good play. The course follows the natural contours of the excellent terrain, and the greens are in very good condition. There is also a friendly little clubhouse, bar and restaurant, with views of the course. Green fees are 60 Euros weekdays and 75 weekends, which make the course an excellent bargain. The D Hotel is a modern facility overlooking the River Boyne and historic, downtown Drogheda. It's close to a cluster of affordable and not-so-affordable golf courses, as well as Newgrange, the Neolithic tomb that's one of Ireland's most popular tourist attractions. It has in-room, high-speed Internet access, and the Scotch Hall shopping complex is within spitting distance. There is a pedestrian bridge to the town center. It's a 104-room facility with a lounge, bar and restaurant. The Johnstown House Hotel and Spa in Enfield, not far from PGA National, is a Georgian house that dates back to the 1750s . If you're looking for a little Irish architecture, this place has it. The 18th century drawing room has ornate doors and a Rococco ceiling, with Rocaille ornamentation, showing a boy playing a bugle, a bird swooping on a fly and a bow and quiver with arrows. Owned by Marriott, it's got most of the modern amenities the weary traveler in Ireland might be looking for, including a leisure center that has a swimming pool, gym and outdoor tub. It also has a spa and a "relaxation room" overlooking the rooftop garden. It's about a 10-minute walk to Enfield, and its pubs and restaurants. The Glenview Hotel is a good place to play the courses of County Wicklow and other areas in this part of Ireland, including Glen of the Downs, Greystones, Charlesland, Delgany, Powerscourt and the European Club. The 70-room hotel sits high above and right off the N-11 motorway and is only about 30-40 minutes from the city center of Dublin. The property sits in the tree-bedecked hills of Glen of the Downs, with fine views of the Wicklow Mountains. The Glenview also has "The Haven" beauty salon and a leisure club with a fitness center, Jacuzzi, sauna and steam room, a swimming pool and "coffee dock." The hotel has a business room and conference space for up to 250 people. There are a variety of pubs and restaurants, as well as excellent shopping, just over the bridge from the D Hotel. The Johnstown House's Pavilion Restaurant offers fine dining - reservations are required - and the more informal Atrium Brasserie serves breakfast and lunch. Other restaurants are in nearby Enfield, which is about 30-40 minutes west of Dublin. The Glenview has the Woodlands Restaurant, with views of the mountains and the hotel's gardens, and an extensive wine list. There is also the Conservatory Bar and Bistro with casual food and specialty coffees and the Malton Lounge - good for morning coffee or afternoon tea and yet more views. Nearby Bray has an assortment of restaurants and eateries. Laytown and Bettystown is a members' facility, but visitors are always welcome.